To our logical minds – pray when there seems to be no way is totally illogical; and to a totally “logical” mind that is 100% correct. However there’s some things about our world and universe that simply isn’t logical. One of those things is belief in an outcome despite the circumstances – now that’s seriously illogical. There’s something special about being human, we have an unexplainable ability to achieve the logically impossible – to believe that an outcome is possible. This ability exists whether we choose to believe in God or not. So choosing to pray when there seems to be no way, it not so far fetched, because we do that anyway. We just call it “belief”. As a believer in Jesus the Christ, we choose deliberately to pray when there seems to be no way; putting our faith in God to provide an awesome solution. The alternative is to put our faith in ourselves, in others or in fate – what will happen will happen. All previous options are based on the same underlying human ability; to believe we can achieve. So the only difference between a believer in Jesus and someone who does not is this. A believer choses to pray when there seems to be no way. A believer chooses to not rely solely on themselves or others. And certainly not on fate. So the next time you are facing an impossible challenge. Choose to pray; put God to the test. Choose to pray when there seems to be no way. 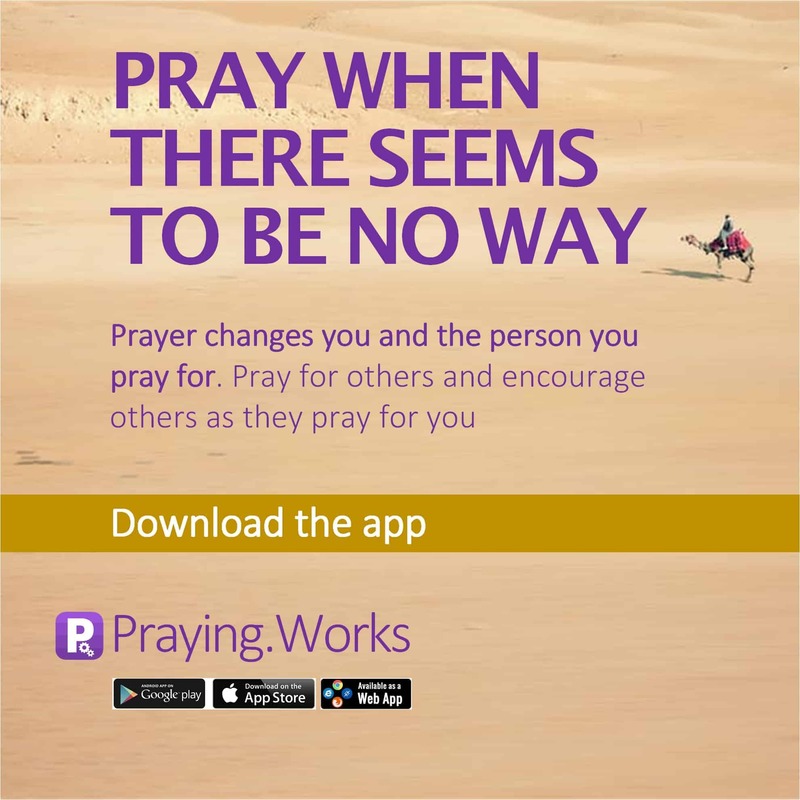 #PrayWhenThereSeemsToBeNoWay, #Achieve, #Appsfordailyprayers #Appsforprayerrequest #FaithGoals #Goals #god #Jesus #prayer #prayerapp #prayernetwork #Praying #PrayingWorksAppTo our #logical minds – #pray when there seems to be no way is totally illogical; and to a totally “logical” mind that is 100% correct. However there’s some things about our #world and #universe that simply isn’t logical. One of those things is #belief in an outcome despite the circumstances – now that’s seriously illogicalThere’s something special about being #human, we have an unexplainable ability to achieve the logically #impossible – to believe that an outcome is possible. This ability exists whether we choose to #believe in #God or not. So choosing to pray when there seems to be no way, it not so far fetched, because we do that anyway. We just call it “belief”. As a #believer in #Jesus the #Christ, we choose deliberately to pray when there seems to be no way; putting our faith in God to provide an awesome solution.The alternative is to put our #faith in ourselves, in others or in #fate – what will happen will happen. All previous options are based on the same underlying human ability; to believe we can achieve. So the only difference between a believer in Jesus and someone who does not is this. A believer choses to pray when there seems to be no way. A believer chooses to not rely solely on themselves or others. And certainly not on fate.So the next time you are facing an impossible challenge. Choose to pray; put God to the test. Choose to pray when there seems to be no way.